When Mike Kugler bought the domain Vacation.rentals last year for $500,300, he did so with an ambitious plan to rank high for the mega-keyword “vacation rentals” in the US. I found plenty of things wrong with Kugler’s SEO strategy, but was prepared to eat my words 6 weeks later when Vacation.rentals began to rank on Page 1. More than a year after the domain was registered, I checked back to see if, after half a million dollars and 12 months of work, Vacation.rentals was bringing in the kind of valuable traffic it was intended to. 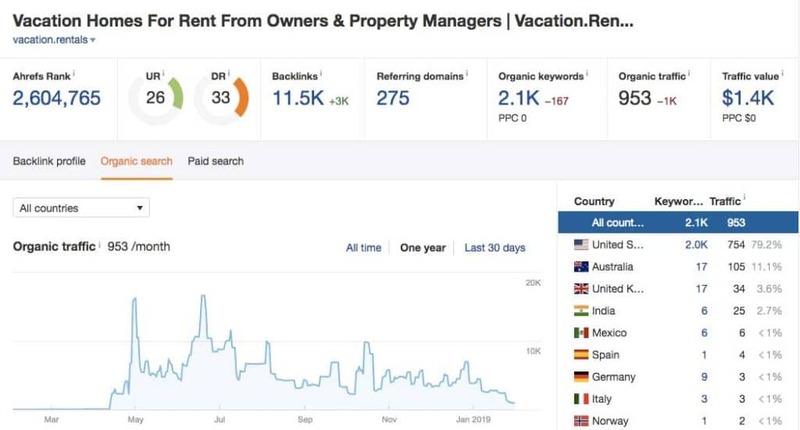 According to ahrefs (which, in my experience, provides an accurate estimate), Vacation.rentals is bringing in less than 800 monthly visitors from organic search traffic in the US. Ranking for the keyword “vacation rentals” was stable and hovering around the bottom of Page 1 / top of Page 2 for while in 2018 but took a massive nose-dive a week ago and has only recovered to around position 100. 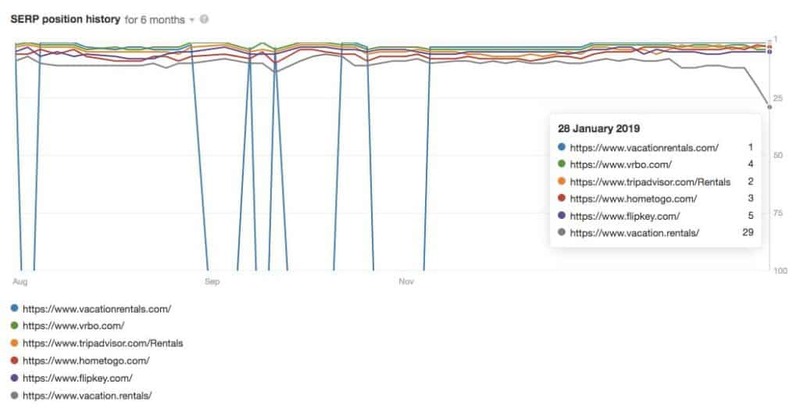 In the last 6 months, the Top 5 sites ranking for “vacation rentals” have shown very little movement, with the exception of VacationRentals.com (show in blue below). Vacation.rentals (in grey) was never in the Top 5, but now it’s slipping even further down the SERPs. And, look, it’s hardly surprising that a site registered at the tail-end of 2017 is struggling to compete with huge companies like HomeAway (estimated revenue around $500 million), who own VRBO.com and Trip Advisor (revenues over $1.5 billion). When it comes to ‘Super hard’ keywords, as ahrefs’ keyword difficulty score calls them, newbies aren’t welcome. Look at the other figures on the above screenshot – ad click through is a whopping 45% of all clicks. A brand new vacation rental website could, therefore, carve itself some steady traffic by investing in ads instead of SEO – something Vacation.rentals has never done. As I said last year, $500,300 is one hell of a marketing budget for a brand new website. But, what’s done is done. I’m not here to just be negative about Vacation.rentals. 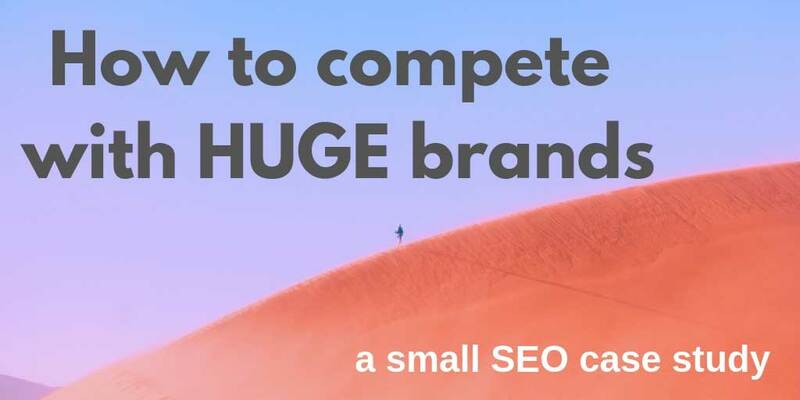 Let’s imagine you or I are in the same situation, and are tasked to compete in a SERP dominated by behemoths – how would we do it? While it might seem fun to throw around ‘power’ keywords like “vacation rentals”, the reality is that they are super competitive with unclear searcher intent. Yeah, we know that somebody who typed it in in interested, at some point, in (maybe) renting something for a vacation, but it’s very unclear. We don’t know where they’re looking, or if it’s a cabin or treehouse they want. We don’t know the time of year or budget or anything useful. So if you’re low on budget and big-brand clout, do yourself a favor and go after the small stuff. Those uncool, not-that-popular, highly-specific longtail keywords. Instead of “vacation rentals”, try “florida beachfront vacation rentals”. So, I hear you ask, if these longtail keywords are so great and full of juicy user intent, why aren’t the big players going after them too? Because they can’t afford to. Huge companies already have websites with thousands of landing pages for different intents, e.g. “vacation rentals california”. They cover every topic in your niche, but they do it broadly. They can’t afford to get stuck into the specifics. Why would they spend their time scraping together a landing page on “florida beachfront rentals” that might get a few hundreds organic hits when their “florida rentals” pages gets thousands? Look at the ahrefs screenshot above – the top-ranking pages for “florida beachfront rentals” are from small sites, with few or no backlinks to the page and traffic around 1,000 per month. This is too small for the likes of VRBO to care about – their generic Florida page gets over 22,000 hits. Use the power of being small to start carving out a really targeted niche for yourself, and keep growing it. Today: “florida beachfront vacation rentals”, tomorrow “luxury vacation rentals las vegas”. In time, you’ll get bigger and bigger and can go after the heavy-hitting keywords like the sell-out you’ll become. It’s really just as simple as that. Be small, have nothing to lose, carve away and drip by drop you’ll start making a dent in the SERP. Now if only Mike Kugler had spent his $500,300 hiring me to do some SEO….